Quick, easy, and most importantly - delicious! Caprese Stuffed Chicken is a perfect weeknight meal that requires few ingredients and very little assembly. 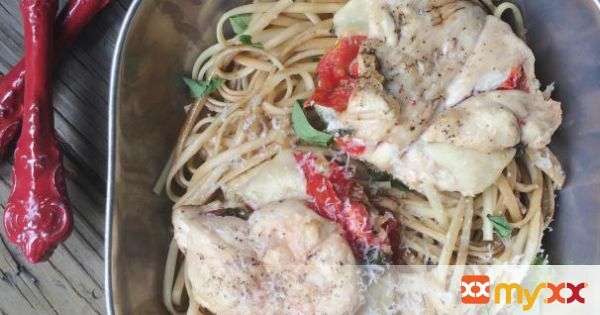 A great way to add some "flair" to any old chicken dish -- but anything stuffed with fresh basil, mozzarella and tomatoes is guaranteed to be delicious. 1. Preheat oven to 400 degrees F. Brush olive oil on both sides of the pounded chicken breasts. Lightly season with salt and pepper and the minced garlic. 2. Layer mozzarella, tomatoes and basil onto one side of the chicken breast. Adding as much (or as little) as desired. 3. Season with additional salt and pepper. Fold the other side of the chicken over top, and secure with cooking twine or toothpicks so the chicken doesn't come unfolded. 4. Cook chicken for 20 minutes in a 9x13-inch baking dish, or on a baking sheet lined with foil. After 20 minutes, remove the chicken from the oven and if is not fully cooked, place back in the oven for an additional 3-5 minutes. 5. Remove toothpicks or twine, drizzle balsamic vinegar over top of the chicken and serve hot!